CEDIA UK EXPO 2009: Living Control introduces more affordable media server | What Hi-Fi? Based on the same platform as the Studio6, the Studio3 is capable of native 1080p video playback while sending two independent streams of 24-bit/96kHz audio to three or more rooms around the home. The device supports a wide range of audio and video formats, including AVI, MP4, QuickTime HD, H.264, VC1 and DiVX 4/5/6. Its modular design, developed and built entirely in the UK, is based on Living Control's own Linux platform. Gigabit networking enables the streaming of video and music across a home network, as well as importing music and video from other sources. Future updates will enable a choice of the latest generation of Full HD optical storage for Blu-ray and other high-definition sources. Studio3 can be controlled via in-wall keypads, TVs and a range of wireless devices including Nokia tablets and the iPhone. Screen art is supplied automatically by Living Controls's own database. 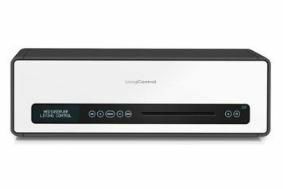 The system is also compatible with a variety of third party multiroom controllers including Crestron and AMX, as well as Sky TV and Philips Pronto remote controls.